If you’ve been struggling to get a promotion or a chance to really take a step up in career—you probably think you’ve tried everything. The reality is, there are loads of simple tips people just don’t think of when they’re trying to take their career to the next level. Some of these might seem too obvious to be true, but they’ve worked time and time again and they really can work for you. Sometimes, you have to move on to move up. If you’ve been in the same role for some time with no advancement in sight, it is likely that your superiors have you pigeonholed there. No matter how hard you work or how much potential you show, it can be difficult to convince people you’re worth it when they’ve seen you in the same position for a long time. They might also consider you an asset for that particular position and don’t want anyone else doing it. Regardless, if you want to get unstuck from this spot, it’s likely you will have to move elsewhere. Sometimes you’ve got to move on to move up. The more qualified you are—the better position you’ll be in for a promotion. Many employers will actually want to help you get more skills and they may even pay for extra tuition or a course. You don’t have to give up time working either, as many qualifications can be studied for in the evening (or your employers might even let you take some time off work while still being paid). Knowledge is power and the more you expand your expertise and gain valuable insight into industry trends and development, the better. The old adage, “It’s not what you know, but who you know” still rings true today. It’s unfortunate that meritocracy isn’t completely prevalent in every industry, but sometimes you’ve just gotta make sure you know the right people. Networking is an important ingredient to success, so be sure to make new connections in the industry as often as you can. There are loads of ways to network, including attending conferences and taking part in team-building exercises. You might think that going out socially with your colleagues and bosses is just about unwinding, but you might find the chance to bond more with your superiors is just what you need to be at the front of their minds when the next promotion comes up. Workplaces shouldn’t work like this, but sometimes they do. If you are well-liked by your boss and colleagues, you will be entrusted with more responsibility, included in more events and projects and considered for more promotions. You should already be working hard. You might even think it’s impossible to work harder. However, simply offering to stay late occasionally could make a huge difference in your employer’s opinion of you. Taking more initiative at work, being a self-starter on new projects and going above and beyond to make your boss’s life easier are all ways to stand out at work and take your career to the next level. Manage your time better at work and get more done with these productivity tips. This one’s a biggie – but sometimes it might be the right choice. 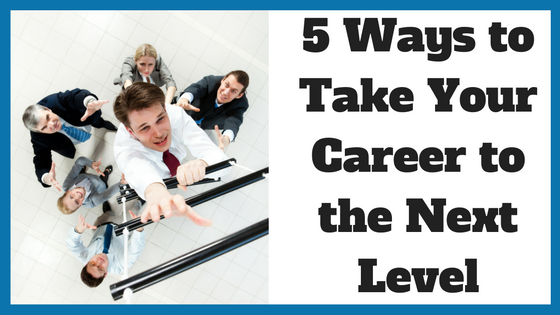 In rare occasions – you might find you’ve reached the ceiling in your current career. Some industries are harder to progress in than others, or have very few opportunities to move up the ladder. Changing careers is a tough choice, but it’s one some people realize is the right one. Take a long hard look at your career and work out if it’s really as long term as you think. How much do your bosses earn? How many people actually get to that level and how long does it take? The reason you got into this industry might not be a reason to stay. These are all things you need to analyze before deciding to switch or stick at it. Once you do decide to take the plunge, do your due diligence. Conduct informational interviews with professionals in your desired field, use LinkedIn to network with industry professionals and find out what qualifications you need to get where you want to be. Thinking of hiring a career coach to help you take your career to the next level? Browse our directory of career coaches and get a FREE consultation or request a personalized coach recommendation!